A program featuring some of the greatest setting commemorative music from the Renaissance, including works of Giovanni Pierluigi de Palestrina, Tomás Luis de Victoria, Josquin des Prez, Francisco Guerrero, Walter Lamb, Nicholas Ludford, John Taverner, John Sheppard, and Thomas Tallis. The Choir of New College Oxford is firmly established as one of the most acclaimed British choral ensembles featuring boy trebles and men. Celebrated for its distinctive sound, the choir embodies the splendor of the English choral tradition. Founded in 1379, the choir frequently performs in prestigious venues worldwide, including St Peter’s Basilica and the Sistine Chapel (Rome); St Mark’s Cathedral (Venice); Cadogan Hall, Royal Albert Hall, and St. John’s Smith Square (London); Concertgebouw (Amsterdam); National Cathedral (Washington DC); Suntory Hall (Tokyo); and the Sydney Opera House. The choir’s notable versatility is reflected in its diverse core repertoire, with a particular scholarly focus on renaissance and baroque music. Recent programmes have included Bach’s St John Passion, Mozart’s Requiem, symphony anthems of Purcell and Blow, Handel’s Messiah, and the great Anglican choral and organ works of the 19th and 20th centuries. New College Choir collaborates with some of the world’s finest instrumental ensembles, including The English Concert, The Academy of Ancient Music, The Orchestra of the Age of Enlightenment, and the European Union Baroque Orchestra. The choir’s world-class sound is crafted under the direction of Robert Quinney, associate professor in the University of Oxford. As well as directing the choir, Quinney maintains an accomplished career as a solo organist and prolific recording artist: his discs of organ music (with The Sixteen, Westminster Abbey Choir, and The Choir of King’s College Cambridge) have been widely praised. He has held prestigious musical posts at Westminster Cathedral, Peterborough Cathedral, and Westminster Abbey, where he was the organist for the Royal Wedding of Prince William and Kate Middleton. New College Choir has recorded well over a hundred discs and have earned numerous accolades, including Gramophone awards for Best selling disc and Best of category – Early Music, as well as the Preis der deutschen Schallplattenkritik. The choir is featured on prestigious international labels including Decca, Erato, Hyperion, Collins Classics, and Avie, as well as on its own label, Novum. 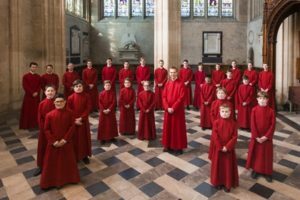 Alongside their concert work, the Choir of New College Oxford’s roots lie in the performance of music as an active part of the liturgy, and often sing special services and conduct workshops while on tour.